Kiosk operator Redbox will launch an instant video streaming service that starts at $6 a month, providing another challenge to dominant movie rental company Netflix Inc in the battle for home entertainment dollars. The price for online movies from Redbox and Verizon Communications Inc is lower than the $8 monthly fee charged by Netflix for unlimited viewing from its larger online library of films and TV shows. “Redbox Instant by Verizon” will start selling subscriptions through a limited beta test later this month, the companies said in a statement on Wednesday. Redbox Instant also will offer an $8-a-month plan with movie streaming plus four one-night DVD rentals from Redbox kiosks, a statement from the companies said. For $9 a month, customers can rent high-definition Blu-ray discs in place of traditional DVDs. Streaming and DVD-by-mail packages start at $16 on Netflix. 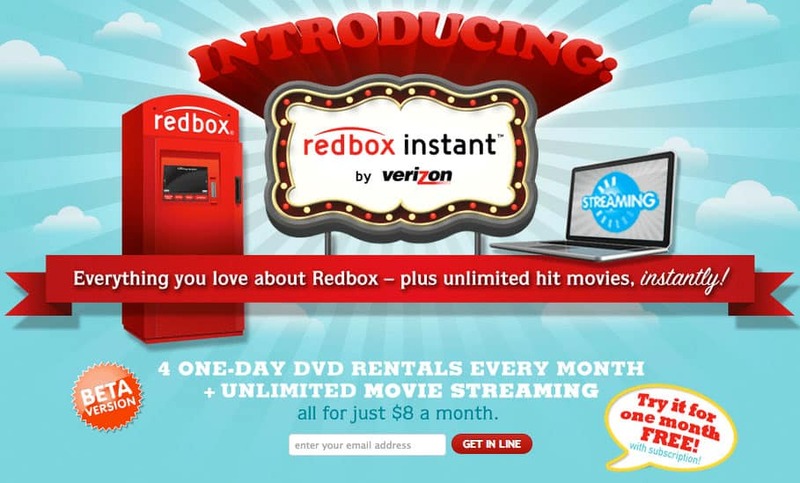 A Redbox spokeswoman confirmed the company also will offer the $6 streaming-only plan. If you can’t find the signup form look for this banner on the homepage and it will take you to the signup page. Do you want to free Rental on Redbox? Check out this offer and get a free rental Today!